This tome is the perfect resource for games masters whose campaigns are nearing epic levels of play and need additional support to take their campaign beyond 20th level. 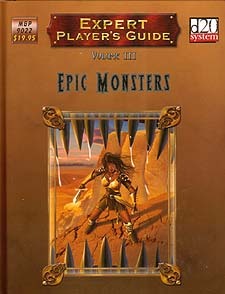 With a veritable plethora of tremendously powerful creatures detailed within, Epic Monsters is the definitive source of challenges for the emerging epic level campaign. In these pages lurk a huge collection of unique, epic and near epic level monsters to challenge your party with. In addition to the 150+ monsters packed inside, we have included an appendix of powerful epic level antagonists. Immortals, the Lord of the Infernum and Bodiless Ao (from the final chapter of the acclaimed Drow War series) all make an appearance in this section. There is also a comprehensive list of epic level feats for use in your game, including additional standard feats possessed by monsters within this book and old feats updated to expand them beyond normal levels. Requires the use of the Dungeons and Dragons Player's Handbook and Epic Level Handbook. This product utilises updated material from the v.3.5 revision of these rules.